What is an Emulsion in Asian Skin Care? Going back to high school days - emulsion in science terms, is a mixture of two or more liquids. Often immiscible - for example water and oil. When those two are mixed together, tiny droplets of the oil is dispersed throughout the water, forming what you call an emulsion. In asian skin care terms, an emulsion is just a very light moisturising liquid/lotion. It works with your skin's natural sebum to promote hydration. Often it is water based, so it won't clog up your pores. I love the packing! The products comes in a very sturdy transparent glass bottle that has a lovely blue gradient and gold pump. The pump is great as it enables you to control how much product comes out and is very hygienic. There is 100ml of product; it's suitable for all skin types. I applied this after cleansing and toning my face; one pump is enough to cover my entire face. The scent is very soothing and gentle; the texture is thin and lightweight. As you can see in the photo, it started running while my camera was focusing due to it's thin consistency. It has a really pleasant cooling sensation when you apply the product and it easily absorbs into the skin. 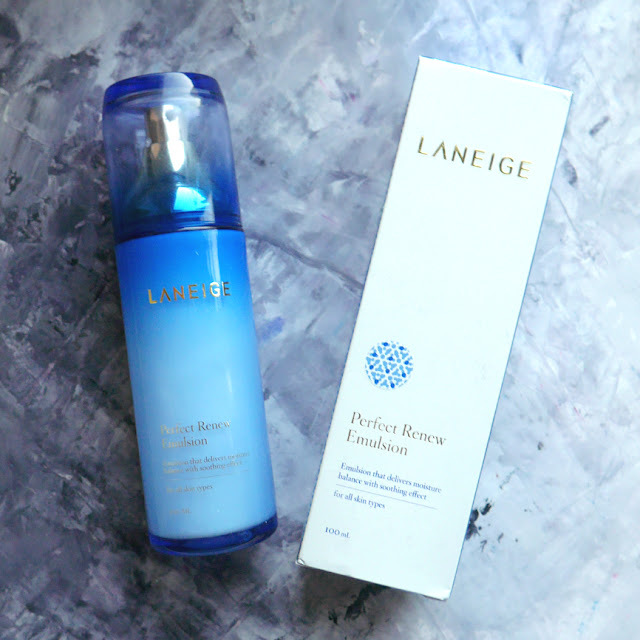 My skin drank up all the good stuff immediately, resulting in plumped, hydrated and smooth skin. It's not oily and does not leave any residue. I have been using this for 3 months now; I can see improvements in the texture, hydrations and luminosity of my skin. There is still a lot of product left in the bottle, so you get your money worth. 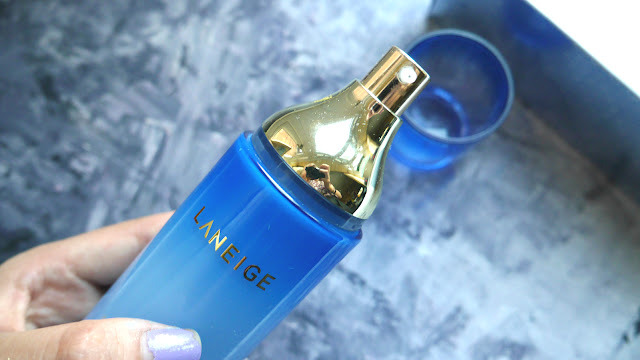 There are no cons about the product itself, the only thing I can think of is that it's not travel friendly and that Laneige does not offer the emulsion in a travel size. I followed your blog too :) Mind to follow each other via instagram?